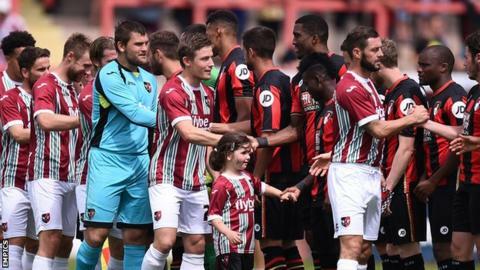 Exeter City are to help financially-struggling neighbours Torquay United by waiving their right to half of the gate receipts for Friday's friendly match. The Grecians say they are returning the gesture made by Torquay when they had similar financial problems in 2003. Back then Exeter's fans had just taken over City, which had debts of £4.5m. The Gulls were taken over by a consortium last month, but had to close the club's academy and part company with manager Chris Hargreaves. "We have not forgotten the terrific gesture by Mike Bateson and Torquay United when they agreed to waive their right to a share of the gate receipts in what was our hour of need," Exeter vice-chairman Julian Tagg said in a statement. "We have always maintained a fantastic relationship with Torquay and we sympathise with their current situation. "We hope the new regime can bring stability to the club and return them to the Football League in the very near future, so we can commence our great rivalry in a more competitive environment," he added. The two clubs will meet at Plainmoor on Friday in what will be Torquay's final pre-season game before the start of the National League season. "It is fantastic to see Devon clubs sticking together in times of adversity," said Gulls chief executive Steve Breed. "It is important for the people of Devon to support all our local sides because we are very much a football outpost here in the West Country and it is important to build bridges with local teams within our community."